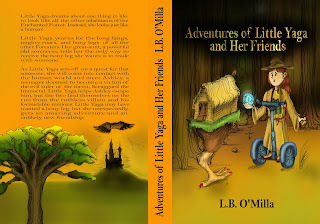 My special author guest today is L. B. O’Milla and we’re chatting about her new middle-grade YA fantasy, Adventures of Little Yaga and Her Friends. L. B. O’Milla was born in Kiev, Ukraine (back then a part of Russia), and loved to read and write from an early age. Her dream was to become a writer, but due to religious and ethnic persecution she faced, she was unable to pursue that dream in her motherland. When she was 26 years old, she with her husband and daughter fled the country. They wound up first in Vienna, Austria, then in Rome, Italy, until finally entering America as refugees. In the US, she graduated from NYU and worked as a physical therapist all while raising her family, but she never gave up her love of writing. Having grown up in a family that exposed her to literature, the arts, and music, O’Milla enjoyed Russian folklore and its characters. She worked very hard to learn English, so she could write in English, the language of her new country. One of L. B.’s great surprises was running into a former high school teacher here, in America, who had also emigrated from Russia. The teacher pulled out some notebooks of L. B.’s old writings that she had saved and brought with her to this country. Encouraged, L. B. kept writing. In her spare time, L. B. enjoys reading, writing, laughing, playing Scrabble, spending time with friends and family, attending stage performances, traveling, and participating in outdoor activities. Widowed at an early age, her biggest supporters are her children and her sister. Welcome, L. B. Please tell us about your current release. Little Yaga is a teenager who lives with her old hag of a grandmother in a house on top of a chicken leg, deep within the Enchanted Forest. She is troubled by her own appearance. While all the other Forest creatures have magnificent fangs, thunderous roars, and bony legs, Little Yaga looks like a human. She even wears custom crafted dentures to give herself fangs! 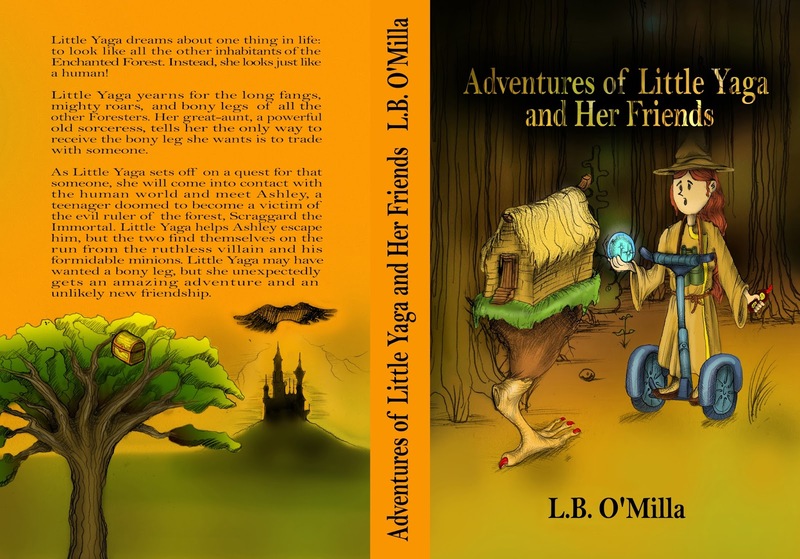 In her quest to fit in with the Foresters, Little Yaga listens to her great-aunt, an old enchantress, and travels to the human world where she meets a group of teenagers on the run from an evil sorcerer. Together with her new friends she returns to the Forest. Scraggard the Immortal, the ruler of the Forest, uses the energy of humans to remain immortal. When he captures Ashley, a human girl, Little Yaga takes pity on her. She gathers a group of both old friends and new to help Ashley escape from Scraggard and save the Forest from his malevolent reign. I was inspired by the modern technological advances and wanted to show how they sometimes seem to work like magic. I thought it would be interesting to draw parallels between the modern technology and good old fairytale magic. In my novel I play with this idea. For instance, the characters from the enchanted forest think a remote control is a magic wand and a cell phone is a magic looking glass, while the human characters believe the magic talking stove is a programmed mechanism and a magic piece of coal is a voice activated device. A few minutes later, they were standing on the bank of the rapidly flowing Milkshake River, which smelled like Ashley’s favorite mixture of strawberry, raspberry, and watermelon. A note posted on the trunk of the weeping willow growing on the riverbank said, “If you want to cross it, drink it.” Instead of leaves, there were small green cups dangling from its branches. Ashley’s eyes lit up, and she reached for a cup, but Little Yaga grabbed her hand and forced it down. Right now, I am working on two projects. One is a spinoff of the Adventures of Little Yaga and Her Friends, and the other one is Diary of a Soviet Emigrant, which is a lighthearted and humorous recount of difficulties and challenges a newcomer from the Eastern European block must deal with to adapt to a new cultural environment. I don’t remember a time when I did not consider myself a writer. As soon as I started reading literature on my own, around age nine or ten, I began writing. Unconsciously, my first pieces imitated the styles of the authors I was reading at the time, no less than Tolstoy, Chekov, O’Henry, Maugham (whose works were translated into Russian), etc. My life-long dream to write full-time has not yet come true. I still practice physical therapy from nine to five and write mostly late at night, on weekends, and sometimes on vacations. I love to rhyme. When I first came to the US, I was surprised American poets had pulled away from such a form of expression. My characters are still prone to rhyming on occasion. I never wanted to do anything else for living but to write. I would also like to thank Lisa for this wonderful opportunity to share my thoughts and experiences. It’s been my pleasure having you visit. Thanks so much, L. B.!